Epoxy putty for high-strength, 100% waterproof, permanent repairs to rotted or damaged wood. Great for use on non-structural elements such as wooden door frames, windowsills, deck boards, and trim. Fills screw holes without shrinking, and does not sag on vertical surfaces. Easy to sand, machine, or fasten. Can be painted or stained to match surrounding wood. Use indoors and out. Kit Sizes: 2-Pint, 2-Quart. Kits include equal amounts of resin and hardener. Dry rot, dings, dents, chips, and gouges are real eyesores. The thought of repairing rotted wood, restoring damaged wood that has historical significance, or attempting to remove & replace missing wood that’s irreplaceable can make you want to rip your hair out. 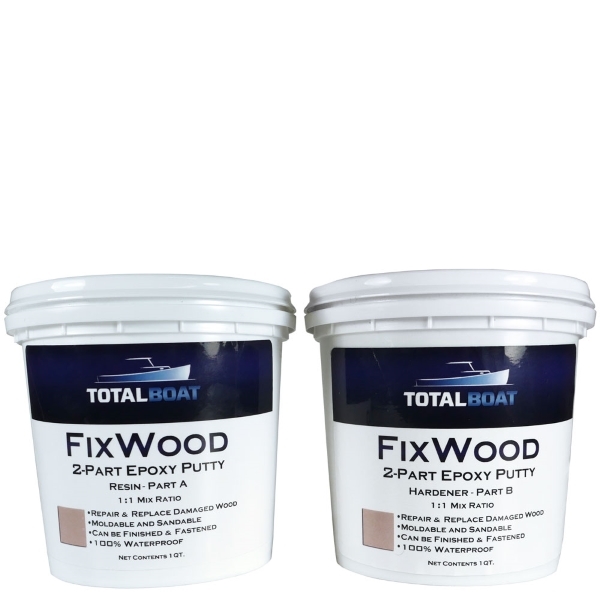 When ripping out the bad wood just isn’t an option or finding a replacement for missing wood just isn’t possible, use TotalBoat FixWood marine-grade wood repair epoxy putty to repair it in place—fast, and for good. TotalBoat FixWood has no VOCs or obnoxious odors, but you do need to wear latex or nitrile gloves to protect your hands while working with it. Just knead equal amounts of resin and hardener together until the mixture is a light tan color, with no streaks. Press the mixed putty firmly into the damaged area to push out any air pockets, and overfill the cavity slightly so you can sand the surface smooth after curing. To replace a missing piece of wood, sculpt the mixed putty in place by hand or with tools. The FixWood putty stays where you put it, without sagging, and retains its shape while curing. Once it’s cured, you can carve or grind it to refine the shape. Let your repair cure overnight then sand, if needed, and finish or fasten. If you want to blend the repair into the surrounding wood, just stain it or coat it with 1- or 2-part polyurethane paint or varnish. Repairs are 100% waterproof and as strong or stronger than new in just a day, and can hold nails, screws, and other fasteners firmly. If the wood is soft from dry rot, inject or apply TotalBoat Penetrating Epoxy first to consolidate the wood. While the Penetrating Epoxy is still tacky, apply the mixed FixWood putty, as directed, and shape as desired. Wear protective gloves, clothing, and eye/face protection while using TotalBoat FixWood. Always wear protective gloves when kneading or shaping FixWood by hand. When sanding FixWood, wear protective gloves, protective clothing, face protection, and a proper respirator. Be sure to read and understand the instructions and the safety information in the Technical Data Sheet and Safety Data Sheet (SDS) before using this product.